"Wayne Visser's The Age of Responsibility elegantly and persuasively demonstrates the limits and failures of traditional CSR and also the kinds of reforms needed to create conditions for genuine corporate responsibility. Rich with insight, information and analyses, and highly readable for its excellent writing and poignant stories, the book is a crucial contribution to understanding where we are with CSR and what we need to do to move forward." "Amongst the advocates of CSR as an innovative management approach, Wayne Visser is a well-known voice. This new book states more clearly than most why CSR should not be dismissed, but would benefit from some serious rethinking." "The Age of Responsibility by Wayne Visser is an important book that should be studied carefully by all those seriously interested in the past, present and future of CSR. For me, the most noteworthy contribution is his "ages and stages" of CSR. Visser identifies five overlapping economic periods and classifies their stages of CSR, modus operandi, key enablers, and stakeholder targets. In forward-looking fashion, he crafts five insightful principles of CSR 2.0 and presents his DNA Model of CSR 2.0 which integrates knowledge and sets forth a more inclusive view of CSR. This book is a significant contribution to the theory and practice of CSR and it will be valued by academics and practitioners alike. I strongly recommend it." "A challenging and thought provoking book. In an age when corporate responsibility is a must for most large businesses, Wayne Visser reminds us that global environmental and social pressures show little sign of receding. He asks: are we as practitioners complacent, or worse, part of the problem? There is hope and optimism but only if we are brave and bold enough to re-engineer corporate responsibility. 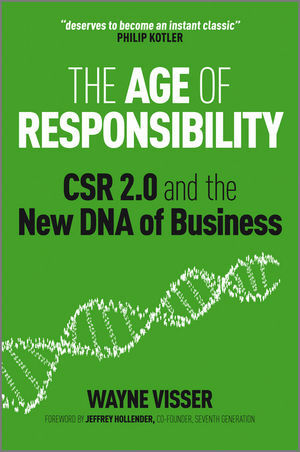 Read on...."
"An authoritative tome on the CSR movement. It provides a comprehensive framework to understand the various stages of (and motivations for) CSR in organizations and the economy to date, and a clear vision of what a truly sustainable and responsible tomorrow entails. This is an eminently well-researched and well-structured book that flows coherently with deep insights and valuable vignettes." "The Age of Responsibility provides a much-needed wake up call for the corporate responsibility movement. This highly readable account of where CSR has gone wrong and where it needs to go next is essential reading for anyone interested in the role business can play in creating a just and sustainable society. This is the best CSR book you'll read all year." "The Age of Responsibility breathes new life into CSR, both by redefining it as Corporate Sustainability and Responsibility and by highlighting why CSR has so far failed to make much difference in the way companies respond to pressing global challenges. In his inimitable style, using clear frameworks and illustrative case studies, Wayne Visser brings real insight to a complex set of ideas at a time when they are needed most. Bring on CSR 2.0!" "In this time of seemingly widespread corporate malfeasance Wayne Visser has put his finger on why CSR has failed to deliver on its promise and what can be done to right the ship. The Age of Responsibility is a must read for anyone concerned about the future of business." "CSR 1.0 did remarkably well through the latest Great Recession, despite having precariously little to say on the big issues of the day and no ready-to-go blueprint for economic transformation. As a result, we are seeing a massive reboot going in the CSR industry – and Wayne Visser is a consistently reliable guide to (and champion of) the emerging CSR 2.0 mindsets and practices." "It is difficult to run a sustainable business in an unsustainable world. So forget about the defensive, charitable, promotional and strategic versions of CSR. The Age of Responsibility is a call for companies to shift to CSR 2.0 – where success is judged by improvements in the overall socio-cultural, economic and ecological systems. If not, CSR will continue to fail, argues Wayne Visser. With an array of cases Visser guides you through the evolution of business responsibility – from the Ages of Greed, Philanthropy, Misdirection and Management to the Age of Responsibility – and shares the five principles of sustainable business actions. Wayne Visser's insightful book is at the same time a compelling personal story about the existential questioning of whether or how it is possible to make a difference through CSR." "Through a concise analysis of recent economic history and through the wisdom of parables, Visser's book offers an illuminating analysis of the heart of greed—and of the path our institutions can take to move from corporate responsibility as a form of occasional philanthropy to an ethic of responsibility that is radically transformative. Visser's new economic myth or meta-narrative creates a compelling vision of a possible sustainable world." "Wayne Visser has rightly identified responsibility as one of the defining issues of our time. Executives, students and citizens should read this book, and make it an integral part of our conversation about business." "High marks for Wayne Visser who brings us a book that both challenges the conventional state of CSR in very fresh and bold fashion, and offers a provocative new vision of CSR 2.0. What is most energizing about this book is that it provides a well documented historical and analytical framework on the progression of CSR over the past century. But in analyzing the current state of CSR, it recognizes that despite amazing achievements and progress, CSR has to leap frog into a new world, one that recognizes the new DNA of business, and one that calls for a CSR 2.0 that goes far beyond the models that currently exist. The new Principles of CSR 2.0 that Visser puts at the heart of this book provide the business community and the CSR world a new path for incorporating the complexity of the social and environmental issues that confront today's corporation, a CSR that can serve as a more transformative force for economic and social sustainability. What a refreshing and creative read! There are few books that can cut to the chase and provide a thoughtful analysis of the current state of CSR while at the same time opening up a vision for tomorrow. This is a contribution to the CSR world that is long overdue and most welcome." "Your new book deserves to become an instant classic. It brings together so many ideas, writings, and stages in the development of CSR. It is a liberal education on the relation of business to society. I hope that it is read not only by companies but becomes a required reading in business schools to prepare business students for a higher level of thinking about their future role and impact. I am happy to endorse the book: A most impressive book! I will recommend it to every company to figure out why they are practicing CSR and how to really practice it to make a difference to their profits, people, and the planet." "The Age of Responsibility will change the way you think about CSR, allowing you to discard myths and to work towards a systemic view of CSR. Wayne Visser holds up a mirror to the CSR community and to business and society itself, providing a brilliant lens with which to see our past and envision a new future. Visser projects a new type of CSR he terms "CSR 2.0". The Age of Responsibility is a call to arms: inspiring, engaging and visionary." "The Age of Responsibility and its proposed CSR 2.0 - perhaps better called Systemic or Radical Corporate Sustainability and Responsibility - shows, in the same way that Natural Capitalism does, that reinventing our industrial model is not only imperative - socially, environmentally, economically and morally - but also a great opportunity for those pioneers that blaze the trail." "Whether corporate social responsibility has failed, or whether it is still finding its feet pending further market pull, one thing is clear: without a life-giving understanding of responsibility as the ability to respond there's no point to anything. Wayne Visser does us all a service in exploring the opportunities and challenges that such responsibility entails." "All individuals interested in the evolution of Corporate Sustainability and Responsibility should feel compelled to join Wayne Visser in his quest to better understand why efforts to implement CSR practices have not yet yielded the desired outcomes. In The Age of Responsibility, he draws on his gift for language and storytelling to lay out the case for a new kind of CSR – CSR 2.0. Using Web 2.0 as a metaphor, Visser identifies the interconnectedness of humans in their efforts to define what the world of business should look like. The journey is thought provoking, an education on where CSR has been and where it needs to go and a story imploring the reader to seek out "a unique and invaluable way to make a difference through CSR"." "The good news: Business is shifting from making money in the simplest way possible, towards solving global problems and making money in the process.The bad news: Progress is slow. Wayne Visser paints the big picture using an astounding amount of detailed knowledge." "A world based on rights without responsibility can only lead to destruction. And when the rights are unbridled rights of giant corporations they trample on the earth and people. Wayne Visser's The Age of Responsibility calls for a vital shift from rights to responsibility. It is a must read for all." "CSR 2.0 is a great concept. Good luck with it. And as Wayne Visser rightly adds: smart government regulation is absolutely essential." "The book is a thought provoking and cutting edge addition to the CSR literature. It integrates strategic and stakeholder perspectives to provide a new model of implementing change and innovative thinking. In extending the paradigm of CSR it promotes the role of leaders in bringing about positive societal change through stakeholder engagement and it does so through an understanding of the practical issues facing business leaders of today. Moreover, it challenges every one of us to think and act differently, to bring about mass global change enacted at the local level, and to incorporate social enterprises and social networks in this transformation. The global financial crisis has further reinforced the timeliness of this book and its arguments of a new way of thinking and acting in the area of sustainability and responsibility to bring about systemic change." In this landmark book Wayne Visser shows how the old model of Corporate Sustainability & Responsibility (CSR) is being replaced by a 2nd generation movement. This generation goes beyond the outmoded approach of CSR as philanthropy or public relations (widely criticised as 'greenwash') to a more interactive, stakeholder-driven model. Wayne Visser is Founder and Director of the think-tank CSR International and the author/editor of twelve books, including nine on the role of business in society. In addition, he is a Senior Associate at the University of Cambridge Programme for Sustainability Leadership, Professor of Sustainability at Magna Carta College, Oxford, and Adjunct Professor in CSR at the La Trobe Graduate School of Management in Australia.